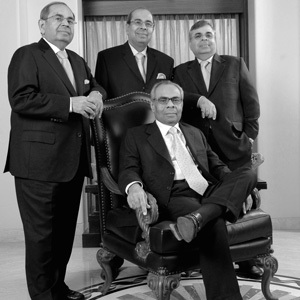 The Hinduja brothers head up the Hinduja Group, a global conglomerate company in London. Srichand and Gopichand Hinduja have lived in London since 1979, Prakash Hinduja manages the Group's finances in Switzerland and the youngest brother, Ashok oversees the Indian interests - oil, motors, telecommunications, chemicals and power plants. Srichand Hinduja is the chairman of the Hinduja Group. The brothers are all conservative, vegetarian and teetotallers. The Hinduja Group which includes a number of companies is now one of the largest diversified groups in the world. The Group employs more than 70,000 people and has offices all around the world. In 2014 the Hinduja brothers were awarded a Lifetime Achievement Award in the UK at the House of Lords. As of March 2015, the Hinduja brothers are worth an estimated £14.6 billion. The brothers have also headed up the Hinduja Foundation, the objectives of which are the advancement of education and medicine throughout the world, the relief of poverty, hunger and sickness and the advancement of interfaith understanding. The Hinduja Foundation is based on the belief that philanthropy, a sacred social responsibility of all enterprise, is worthier when it encourages self-help and sets an example for the younger generations.